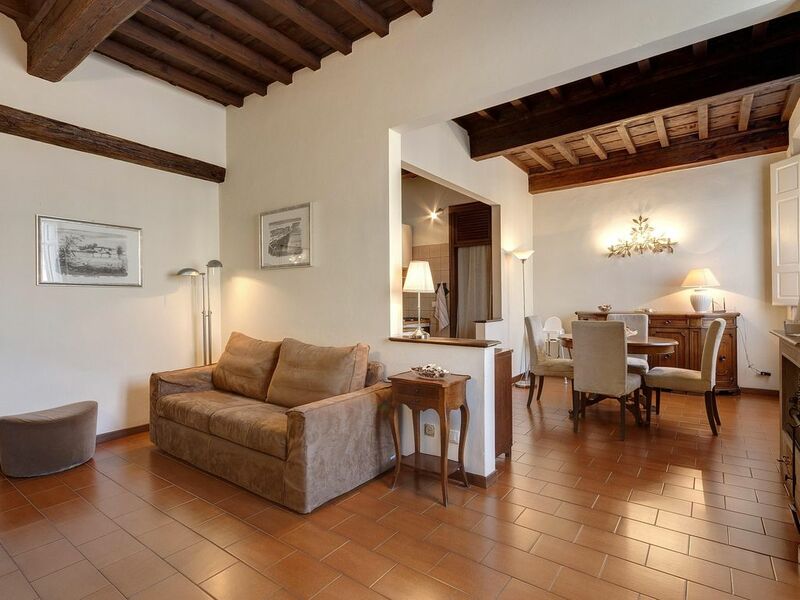 This beautiful apartment is located in the heart of Florence, in a limited traffic zone at walking distance from the Duomo and the main museums (the Academy museum, the Uffizi gallery, San Marco Museum, the Archaeological Museum). It is very comfortable and tastefully furnished with the attention to detail. Its ancient wooden ceiling create a warm atmosphere. The house is equipped with many comforts: independent heating and air conditioning system; a fascinating, welcoming master bedroom with an old, big and comfortable master bed; a living room, which is separated from the bedroom, equipped with comfortable double sofa bed. You can easily reach our apartment from the station with a 10 minute-walk, and you will find it is an ideal starting point to visit the town on foot. Its position will allow you to reach easily and quickly every part of the town and suburbs (Michelangelo Square, Fiesole); moreover, the main bus lines stop near the apartment. The kitchen is fully equipped with microwave oven, American coffee machine, toaster, oven, fridge, freezer; a washing machine and an electric iron will also be available to our guests. The bathroom is equipped with shower and hairdryer. The apartment is located in a traffic limited zone (called ZTL in Italian), which is accessible by TRAIN: if you stop at Santa Maria Novella station, which is about 600 m away, you can reach the apartment easily on foot (10 minutes) or by bus, which stops very close to our apartment (lines 1-14-23). From SMN Station to San Marco square on foot: http://goo.gl/maps/U96HX or by bus number 23, 14 or 1 http://goo.gl/maps/FePzi By CAR: from the A1 highway, take the exit Firenze Sud or Firenze Nord, follow signs to the city centre. After 20 minutes driving along the ring road streets, you can park your car in the nearby Parterre free parking located in 9, Via Madonna della Tosse. For further information about the Parterre parking, go to www.firenzeparcheggi.it. From the Parterre parking, you can reach the apartment through a 10-minute walk or by bus (line C1). Upon agreement and on request, you can park your car inside one of the many garages of the limited traffic zone. I am a civil lawyer and I decided to rent my apartment to tourists: it is a very pleasant experience that allows me to meet friendly people from all over the world. This charming apartment embellished with old wooden beams, stone shelves and antique furniture creates a warm atmosphere and a very particular charm. The bathroom with window is equipped with all modern bathroom fixtures, such as sink, bidet, WC and walk-in shower. There is also a high-quality hairdryer and a small soap set available to our guests. The kitchen is fully equipped with a cooktop, an electric oven, a microwave oven, a fridge, a sink, a moka pot, a boiler, a toaster and a mixer. The American kitchen is located in a dedicated area of the sitting room, separated from the dining room by an arch. It is very big and fully equipped with pots and flatware for four people. Moreover, it enjoys a four-burner stovetop, a fridge and a separated freezer. The apartment is equipped with washing machine, electric iron, ironing board and vacuum cleaner, which are all located in the utility room. The dining room, just next to the kitchen, is equipped with four comfortable chairs and a round table. In the sitting room, there are a beautiful sofa seats three and two comfortable poufs, as well as flat screen TV with DVD player and satellite dish. Finally, the apartment features an air conditioning system adjustable with remote control and independent heating with gas boiler, adjustable from the apartment with temperature control. Our hostess thought of everything. We had a lovely stay. We were able to wash a load of laundry, make meals and even watch a video about highlights of Florence. We appreciate all Elisabetta did for us. The location is very central, making commutes easy to main attractions. Only one recommendation would be to remember your ear plugs as the bus runs nearby and there are many noises at night. This is understandable in such a good location. Only a few hundred yards from the David. Elisabettha was very accommodating. We arrived very late and she waited up for us. The apartment was clean, well furnished and we had plenty of room. The apartment was so close to everything we could come home in between museums. Since we arrived very late and missed seeing some things she let us leave our things in the VRBO for a couple of hours until we had finished site seeing. The place you catch the bus is literally in front of the apartment. I would definitely stay there again. I'm sorry for the inconvenience suffered by the guest; it is a very lively square in the city center, with restaurants and bars and lots of people; all this to someone disturbs, but to others no or even like it. Buses however end their runs at 11 pm. Lovely Apartment with the perfect location and gracious owner. Staying at this apartment in Florence is a wonderful experience. It is in easy walking distance from the center of the historic city and just literally down the street from the Academia and Michelangelo's David. Downstairs, there are several food shops. My favorite is Pugi's. In my opinion, they have some of the best pizza in the city. There is a grocery store just around the corner and a the famous Gelateria Carabe only a little further. One of the things I've appreciated the most is the spacious and well-appointed kitchen. It has all the tools one needs to make all of one's meals if desired and to even host guests. The clothes washer means I can pack less when I go there and the bathroom has a comfortable shower (a real bonus). The bedroom has a lot of storage space so that one can unpack and settle in and the bed is very comfortable. Although I was usually out and about most of the time, there is a comfortable two-seater sofa that is a pull-out bed if needed. Having a sitting area with a TV meant I could watch the fireworks on TV on New Year's Eve instead of fighting the crowd. But I could also just stroll down to the piazza around the Duomo and enjoy the festivities and return at any hour, feeling safe. While the location is indeed the bus station, I found the sounds quite tolerable and slept very well at night. Elisabetta is a kind and very helpful owner and makes sure the apartment is well cared for, communicates with you quickly and easily, and does everything she can to make your stay fantastic. Although the first journey up the stairs with suitcases is a workout, it is quite doable and well worth it. I have stayed here twice and plan to again soon. I love looking out the window in the morning at the Basilica de San Marco and museum while having my coffee. And of course, the museum and convent right there is filled with must-see art. I have stayed in this apartment during a hot summer and a cold two weeks in January. In both cases, the apartment had all the cooling or heating equipment needed for a comfortable stay. Fantastic apartment for a very reasonable price. I highly recommend it. The apartment is very spacious and centrally located, but nighttime construction was disruptive. Two of our three nights there were disrupted by nighttime construction. I expected busy square noise but not jackhammers or backup beeping of trucks waking me up! Surely I would have anticipated some notice of this beforehand with the option to reevaluate my VRBO choice. We had a cross of communication that was not meant to offend the host, but she took it that way, when we found dirt/debris inside the bedding on the first night and asked about when the sheets were last washed (a logical question). It was not accusatory on my end, but again perhaps the language was the issue. In any sense, she sent new sheets the next day. I'm sorry for the inconvenience that the guest complains about the nocturnal work of reconstruction of the road surface ordered by the City of Florence without any prior communication. extremely annoying jobs for two nights that have also disturbed my sleep because I live near the apartment. The guest sent me emails during the night asking insistently explanations, as if these depended on me. And then after midnight he also wrote me complaining that the sheets were dirty accusing me of not having replaced the sheets used by the guest who had preceded him. I had to send new sheets the following morning: those supplied were now wet because the guest had put them in the washing machine. I can not explain the fact but I can assure that the sheets are replaced every time. Naturally I was offended by this host's insinuation! However I did not have the opportunity to verify the fact: the guest sent me only a picture of some crumbs on the sheets that could have fallen to him since it was in the apartment from the morning. This is our 2nd visit to Florence and Elisabetta's apartment and we hopewe can return again someday. We love her apartment. Its always clean, her check in information is clear. The bed is comfortable. Having a kitchen helps keep food costs down. The best homeaway experience we have had. The apartment overlooks a dynamic square full of bars, restaurants and pastry shops, exactly in the centre of the city. Moreover, it is at walking distance from the Gallery of the Academy of Florence, which is the home of the Michelangelo's sculpture David, and from the National Museum of San Marco, which exhibits all works by Beato Angelico. Our apartment is located in a strategic location, ideal to reach in few minutes on foot all the main tourist points of interest of the city. Thanks to the main Florence bus lines, which stop next to our apartment, you can reach every part of the town and suburbs (Fiesole or Michelangelo Square). Few metres from the apartment you can find a high-quality restaurant called "L'Accademia", where you can try some of the best Italian dishes. La prenotazione è confermata con il pagamento dell'acconto/caparra. La disdetta della prenotazione non dà diritto alla restituzione della caparra Consumi utenze acqua luce e gas compresi nel prezzo. Internet WI-FI compreso nel prezzo.